The Sam Sharpe Teachers College is not only one of the top teacher training institutions in Jamaica, it is right there amoung the top colleges in Jamaica too - teacher or not! Now although I did not attend the institution, I have a personal connection to it. My youngest sister is a proud graduate (and is doing very well) of this esteemed institution and it is also a part of our small community. "Sam Sharpe Teachers' College is a special institution, because it holds the name of National Hero, the Right Excellent Samuel Sharpe, who embodied the spirit of freedom. 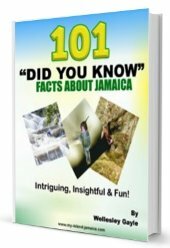 One of the main attributes of education is to free the mind and to free up humankind, therefore Sam Sharpe embodied that," Dr. Pinnock told JIS News in an interview. Are You A proud SHARPIE? The school has truly come a far way since it's inception in 1975 by the Government of Jamaica through the World Bank II programme. With now 51 members of staff, it continues to provide a dynamic programme of activities to help trainee teachers actualize their true potential and make their contribution to Jamaica's nation building. Since its inception, the college has graduated over 6,000 trained professionals (Sharpies), who are currently making their mark on Jamaica's (and the world) development. Special note must be made of it's longest serving steward, Ms Cecil Walden. Dr. Walden has honoured for over 40 years of dedicated service to the college and the general teaching profession in Jamaica. The main programme on offer at the school was the Diploma in Teaching, which was three years in duration full-time and four years and two summers part-time, but according to a JIS report the College was expected to commence the four-year full-time degree programme this month (September 2010) with the Diploma being phased out. There are also courses in Primary, Early Childhood and Special Education, Guidance and Counselling, Music, English Language and Literature. Additionally, they also offers Post Graduate Diploma /Advance Placement & Switching/Upgrading Programme. There is also good news for sports-loving students who want to fulfill their dream of a degree in Physical Education, as discussions are underway with G.C. Foster College on this possibility. The school currently boast a state of the art computer lab, which is considered to be probably the first of its kind in Jamaica and the Caribbean! They also have a dynamic marching band that one of the best in the island. 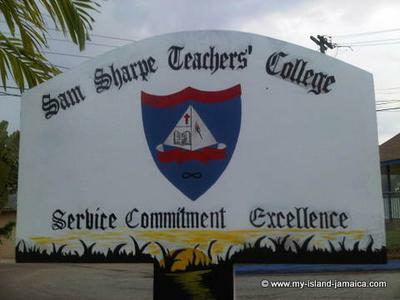 Sam Sharpe Teachers' College is currently the only teacher training institution in western Jamaica. 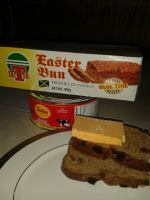 It is located in Granville, St. James. The Sam Sharpe Teachers' College website (above) was recently launched. Feel free to check it out. From their you can learn more about the various departments, student services and alumni information. Return to Colleges in Jamaica from Sam Sharpe Teachers College. Return to HomePage Sam Sharpe Teachers College. Are you a graduate or friend of Sam Sharpe Teacher's College? Do you have a story? What are your wishes for the school? How did Sam Sharpe prepare you for the real world? Enter a TITLE for your Sharpie "story"
If you already had your question prepared, simply copy & paste! Your submission will appear on a Web page exactly the way you enter it here!! You can wrap a word in square brackets to make it appear bold. For example [my story] would show as my story on the Web page containing your story. TIP: Since most people scan Web pages, include the most important information in your first paragraph. Do you have a picture you'd like to add? Click the button and find it on your computer. Then select it. Here are some of the feedback we have received so far.